Zoey loves books. I mean she loves them. Most her playing time is reading books. We have read everyone enough that she has almost every single one memorized to the point that sometimes when I try to read books with her she does it with me. My favorite one to read with her is "Moo, Baa, La la la" by Sandra Bouyton. If you have read the book, it has pigs singing "la la la" so she thought that thats what pigs said. If you asked her what pigs say she would have told you "la la la". She now knows, after a long time of trying to convince her, that pigs say "oink". 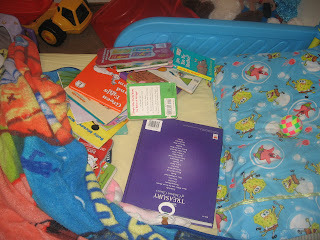 Anyway, the picture below is of almost ALL of her books on her bed. She does this every time she wakes up in the morning or for nap. There is a load of books laying on her bed. She gets not just one or two, she gets almost ALL of the books that belong to her. It's pretty funny and shows her love of books. And I say almost all becasue there really is only maybe 5 or 6 books missing in that collection. You can't see the 7 books hiding under the blanket that I found after I started to get them off and put them away. She is so funny. So if you ever want to get her something, get her a book. She will love it.